Harry Anderson playing for Posh against Oxford. Young Peterborough United midfielder Harry Anderson has returned to National League promotion contenders Lincoln City on loan. It’s a second stint on loan at Sincil Bank for the 20 year-old this season. He scored four goals in 19 appearances for the Imps before Christmas. Anderson made a substitute appearance for Posh against Oxford last month. 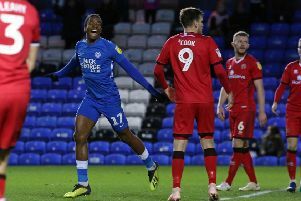 Anderson joins Posh clubmate Lee Angol at Lincoln who have a huge game against table-toppers Forest Green on Saturday, a game that will be shown live on BT Sport.